The Knowledge is the he famously demanding 2,000-mile training course that London black cab operators have to pass in order to qualify for their Hackney Carriage license. The photos and video images recorded by the car will go towards creating a mosaic of 650,000 street pictures and a 200.5-second time-lapse video of the journey. Hyundai will record the drive using new software that will control the camera shutter, based on the car's speed, distance traveled and angle of travel to capture the entire journey photographically. The camera will take a pictures every 6-7 metres, which will mean recording 8,000,000MB of data. A bespoke software engine will then sequence, align and blend the images in real time to create a continuous image that can be seen online at the end of the challenge. The project, called A Streetcar Named Hyundai and mapped out by the Ordnance Survey team who delivered the Olympic torch route, will take a total of 50 days, from 29 September to 19 November, the car being driven by celebrities and employees of Hyundai UK. 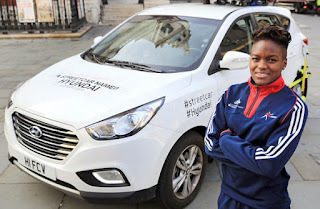 British Olympic boxing champion Nicola Adams, a Hyundai ambassador, will launch the journey and will drive the first leg with Hyundai UK's president and CEO,Tony Whitehorn. Whitehorn said: "We're incredibly proud of how far Hyundai has come in the UK in the short space of ten years. During this time our product range has been completely transformed through innovation, design and technology -all of which are encapsulated in the ix35 Fuel Cell. 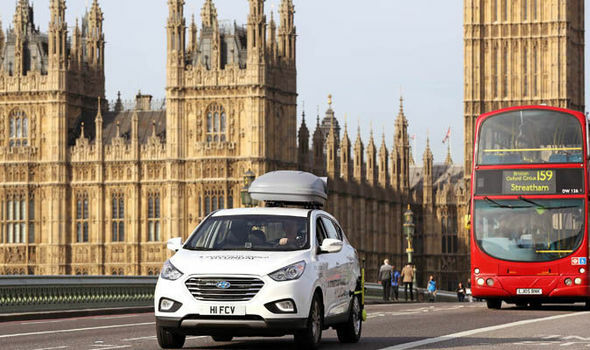 This vehicle is currently the only fuel cell car on sale in the UK and has been tested on the streets of London since 2013." Do You Know What To Do In An Auto Accident? Hyundai Truck: It Should Come In Medium!